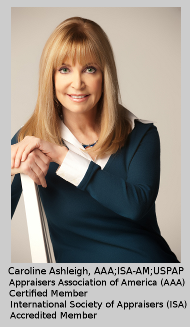 Caroline Ashleigh is the founder of Caroline Ashleigh Associates, LLC, a firm that provides appraisal and auction services throughout the United States, which received the 2013 Michigan Excellence Award in Business. Ms. Ashleigh has been a Female Business Owner for 25 years; Certified Appraiser, Appraisers Association of America for 21 years; USPAP Certified Appraiser for 19 years; Appraiser for 15 years on Antiques Roadshow; 19 years of inclusion in: Who's Who of American Women; Who's Who in the World. Ms. Ashleigh is a graduate of New York University in Appraisal Studies in Fine and Decorative Arts, and is a senior certified member of the Appraisers Association of America (AAA), serving as former co-chairman of the National Conference Committee and Midwest regional representative of the organization. Additionally, she is an accredited member of the International Society of Appraisers (ISA), and is a current USPAP Appraiser, who tested and passed the Uniform Standards of Professional Appraisal Practice of the Appraisal Foundation in Washington, D.C. in December 1997, May 2007, April 2012, February 2014, and January 2016. Caroline Ashleigh has received specialized training in Art Crime Investigation by the founder of the FBI Art Crime Team, and has completed Expert Witness training by SEAK. Ms. Ashleigh’s career began in the museum world as a member of the educational department staff of the Detroit Institute of Arts in Detroit, Michigan and Cranbrook Academy of Art in Bloomfield Hills, Michigan. She became involved in art appraising and founded Caroline Ashleigh Appraisers and Auctioneers, where she catalogued important collections, estates, archives, and served as an art expert in court cases. She has worked closely with major museums, and served as a consultant to several major auction houses including Sotheby’s and William Doyle Auctioneers in New York, together with important celebrity collections such as Debbie Reynolds Hollywood Motion Picture Collection and Museum. ·Ms. Ashleigh’s scope of work has included an 800 million dollar art appraisal of a corporate collection which she completed in 2009. She·is an nationally known appraiser and has appeared on Antiques Roadshow since 1996, and serves as an art expert on HG-TV. Ms. Ashleigh lectures extensively on connoisseurship, and is a columnist and author on art and antiques. She has served as a contributing author to the Antiques Roadshow Collectibles, the Antiques Roadshow Insider Magazine, Art and Antiques Magazine, All About Appraising: The Definitive Appraisal Handbook, and Warman’s Antiques & Collectibles Price Guides – 43rd and 44th Edition. She is the author of Warman’s Field Guide published in 2010, and is a contributing editor to Antiques Trader Magazine. Ms. Ashleigh has been the subject of feature presentations in the New York Times, Art and Antiques Magazine, and Forbes Magazine, and served as consultant to CBS News, "Inside Edition" on the subject of fakes and frauds.